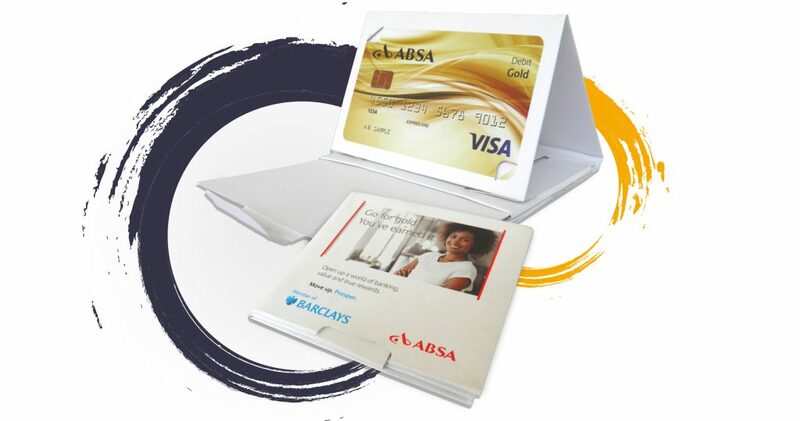 The card carrier is a square-shaped marketing solution, which opens via a small tab to reveal a PVC card and pushes out a Z-CARD® at the same time. It’s a unique banking or loyalty application as it’s an all-in-one solution to house a debit, credit or loyalty card and a Z-CARD® which explains the benefits of the particular account or loyalty programme. Another exciting use for the Card Carrier is to generate awareness around HIV and Aids and sexually transmitted diseases. A condom can be inserted into the Carrier Card, whilst a Z-CARD® generating awareness around these issues can be presented to community or staff members in an easy to use, compact format that they can keep in their pocket or bag.